Fisherman’s Blues… | Scots Whay Hae! It is rare to uncover a film these days that has no imdb reviews and no one I know has ever seen. Exciting even. 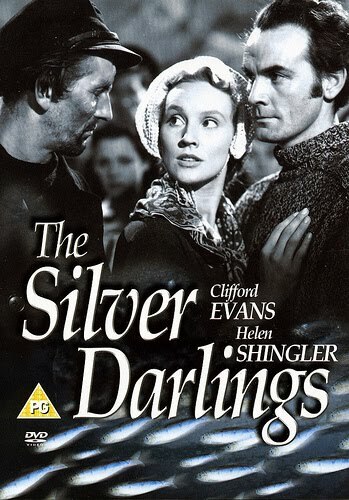 So it was with the 1947 film version of The Silver Darlings that I discovered in a local bookshop. I could find no clues as to what it would be like apart from the blurb on the cover of the DVD but it was worth the risk…just. Advertised as a labour of love for director Clarence Elder and star Clifford Evans, the film feels like a missed opportunity to successfully film this classic novel, one that can probably be explained by the limits of money, time and cast. Apart from the two lead actors no other actor involved had what you could call a career on stage or screen and I would be surprised if there were many takes on any given scene. The film takes the romantic elements of Neil Gunn’s tale about the herring industry on the east coast of Scotland in the wake of the Highland Clearances, but this is to the detriment of other aspects of the story. Although it touches on the history and context; the Clearances, the Napoleonic War, the early attempts to set up a successful industry from a few boats and the deadly outbreak of cholera in the Highlands, the film doesn’t give enough context to make an audience overly care or empathise with the central characters lives. The portrayal of the teenage Finn by Murdo Morrison is particularly awkward as he comes over like a mix of Violet Elizabeth from the Just William tales (there’s one for the teenagers) and the lost member of Spandau Ballet. It is the cinematography that saves the film. The shots of Scotland’s harsh but beautiful coastline are evocatively captured by cameraman Francis Carver, and it is no coincidence that the film comes to life in the action sequences which take place where the land meets the sea. Carver manages to convey the danger that these men would have faced everyday by simply showing the power and unforgiving nature of the landscape. The Silver Darlings from Alastair Cook on Vimeo.